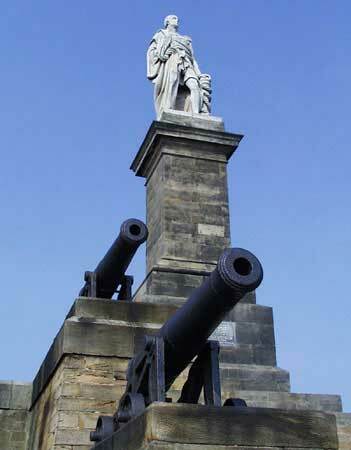 The statue of Admiral Lord Collingwood at Pier Road, Tynemouth. Location: Pier Road, Tynemouth. Materials: Marble and Sandstone. Status: Listed Grade II. The Collingwood Monument celebrates the life and achievements of Admiral Lord Collingwood. Born the son of a Newcastle merchant in 1748, Cuthbert Collingwood first went to sea in 1761 and rose swiftley through the naval ranks as first the American War of Independence and then the Napoleonic War pitched him into a number of victorious encounters. His connection with Lord Nelson began in the 1870's and it was as Nelson's second in command at the Battle of Trafalgar that Collingwood achieved his greatest notoriety, both of master of his ship the Royal Sovereign and by taking command of the battle on the death of Nelson. Following Trafalgar he was awarded a peerage but died at sea in 1810 and was later buried in St. Paul's Cathedral. His statue was sculpted by John Graham Lough and stands atop a pedestal designed by John Dobson. The position of the monument marked Collingwood's family connection with North Shields, allowed the statue to be seen from the sea and the river, and let the great man stare out to sea his hand resting on a rope wrapped bollard. The four cannon on the walls flanking the steps at its base came from his flagship and were added to the monument in 1849, four years after its original completion.